The Income Tax Department has on its website – incometaxindia.gov.in – listed various ways for the income tax assessees to link their Aadhaar with PAN. Some of these facilities are an SMS service, the e-filing income tax portal and through ITR. 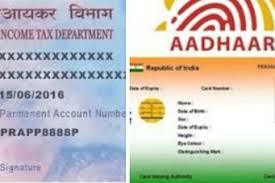 An Aadhaar card number can be linked with a PAN card number online through the I-T Department’s e-filing portal (incometaxindiaefiling.gov.in). In order to do this, the user is required to click on the “link Aadhaar” option on the portal’s homepage to proceed.